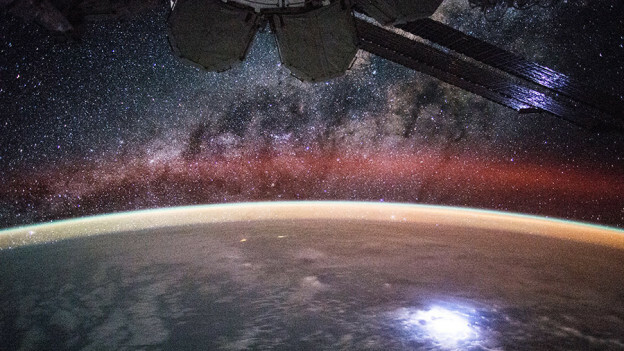 This image taken from a time lapse sequence aboard the space station shows the Milky Way and a lightning strike on Earth. The International Space Station completed its 100,000th orbit early this morning after its first component, the Zarya cargo module, launched Nov. 20, 1998. That is over 2.6 billion miles traveled, nearly the distance from Earth to Neptune (2.9 billion miles), or ten round trips from Mars to Earth. A few hours after the station reached this morning’s orbital benchmark, a several types of Cubesats were deployed from the Kibo lab module’s airlock. More Cubesats will deployed through Wednesday contributing to a wide variety of research designed by students and scientists. The crew is measuring the grip strength of mice today for the Rodent Research experiment. That study is exploring an antibody used on Earth that may prevent the weakening of muscles and bones in space. A laptop computer is being readied ahead of next week’s expansion of the Bigelow Expandable Activity Module (BEAM). The computer will monitor sensors and prepare for upcoming BEAM operations. Congratulations, NASA! And all space agencies involved in humankind’s first semi-permanent home in space: the ISS. Well done! Keep up the good work.